This is super, a DI box without an audio transformer. Thanks Alex! So what's the downside of not having transformer? My active DI has a transformer. Can this be used for bass as is? Yes! A good DI box is what we've been missing, this is a very useful build. I'll be building mostly for recording with the speaker emulation, but I don't have an actual DI with me to verify it all, so I hope someone verifies this. Thanks Alex! I have a TL084 in my box of cack, would this work ok? Yes TL084 will be fine. Stupid question: Is it really okay for amplified signal to be on the little traces of the tagboard and all these 1/4 Watt resistors? I mean it's like... a 100 Watt amp...? Not a stupid question, but it is NOT a 100 Watt amplifier. In fact it is not any kind of amplifier at all. What it is, is a DI (Direct Injection) box - a simple recording/PA interface. You simply plug your guitar into the input jack and plug the output straight into a mixing desk. This way you can record straight to a recording device WITHOUT the need for amplifier/speakers/microphone. You can also plug straight into a PA system with one of these, either without the need for an amp, or in parallel with an amp - most sound engineers will do this with your band's bassist. There is a clever little tone shaping circuit included in this DI box that mimics the sound of a guitar signal run through a 2x12 or a 4x12 speaker cab - basically, it caps off the extreme high and low end of the signal. It's a very good DI box, especially for recording - I have been using one for years. I think I'm misunderstanding this too Beaker. I thought Geoff meant he was planning on plugging a 100W amp into this, and was concerned that it would damage the amp. Am I understanding this correctly that I can plug the speaker output of my amp directly into this pedal without damaging the output transformer? My amps don't have an output for direct in, but the info on this unit seems to indicate we can hook this unit right up to the speaker output? OK nevermind I just read the manual and now I see you need to connect the speaker(s) or load resistor to the "to speaker cabinet" jack. My question now.. When you have speakers hooked up to this jack, does the sound come through the speakers as well as the DI output? This device taps off some of the signal to process as it passes through on the way to the speakers. Sound will come through to your speakers. If you choose to send that signal to a load box or power soak, that is fine. If you attach this device to the speaker out of your tube amp without letting the signal continue to a load or speakers, get ready for smoke and an expensive repair. Quick question about the "12v+" power input: Does this circuit REQUIRE 12v or can it run on other voltages? The reason I ask is that the manual mentions: "48v phantom power", a "9v e-block battery", and both "9-15v AC" and "9-24v DC". On top of that, I read an online review that said something about using an adaptor capable of "6-18v". XLR 1 and 2 should be swapped. XLR1 should be ground. Does anyone have a layout for a charge pump that converts +9v into +12v? Muad'zin how bout a Zener or one of these? Like this one and will probably build one for shts and grins. Anybody seen the schem or layout for the new H+K number 5? Someone asked above but didn't get a reply..
Hi Rex, Our Bass player used one of these for years for his Bass. Ran his Fender P-Bass straight into a Sans-amp, then into the red box, then from it into the PA. I occasionally played fiddle - same story. Piezo pickup from the fiddle to a sans-amp then into the red box then into the PA. Similar story with my guitar amp (Tiny 5watt Champ clone). Put it in between the power output and speaker (instead of using the line in, which we did for the Bass & Fiddle). Used phantom power since the mixer had it, so we never had to worry about batteries. These boxes are worth their weight in gold. Sure saved on wear & tear on our backs not having to lug big amps in & out of whatever venue we performed at. A real Godsend for any working musician, especially if you rely on analog gear. Awesome thanks for the reply! This will now be going on my too build list, the ever growing list! I wonder if it can also be used to "re-amp" a recorded signal. I guess sort of the opposite way it works right now, like I would want to record a clean signal and then feed that signal from an interface into the Red Box and then into an amp? 1st, there were a couple of times that for one reason or another both our Bass player, or I didn't have a sans-amp or other preamp available, so we simply plugged straight into the red box and from it into the PA.
Had to adjust the EQ a bit on the PA but this actually provided acceptable (emergency!) results for the piezo pickup in my fiddle (would also presumably work with an electrified acoustic guitar, although I haven't tried that) and the Bass. It wasn't ideal but it did work and gave acceptable sound/tone when we didn't have an alternative. However this setup doesn't work well for an electric guitar. 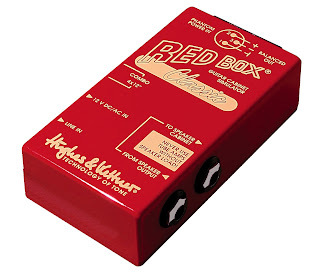 Definitely need an amp/preamp or active pickups if for one reason or another you need to use just the red box alone to run an electric guitar signal into a PA or other recording device. Strangely it was not a huge problem for a Bass guitar with passive pickups although there significant hum. It worked with just the red box inserted into the PA. Must have something to do with the Bass's frequencies. 2cd: The red box really isn't designed for an instrument level input. It's designed for line level or speaker level signals. Even though it did work with a Bass (in a pinch!) It was horrible using it by itself with an electric guitar with passive pickups. Piezo pickups (like in my fiddle, or an amplified acoustic guitar), can give a strong enough signal level to drive the input on the red box but you have to be able to EQ that signal after it leaves the red box(like with a mixer or other type of preamp) to get a decent sound (tone). So; Although you could use it to re-amp a sufficiently strong enough recorded signal, I doubt you would be happy with the results. We did use it in a similar way in a live situation when we didn't have an alternative and made it work with creative use of our mixer but I certainly would have used any other system had I one available at the time. Emergency - hook it up and save the gig, for sure! Re-amp - You really need a preamp or dedicated re-amping device. I hope my experience helps you Rex. Good Luck! I assume that since there is an earth lift switch, the jack sockets should be insulated, certainly looks like they are on the original? The xlr socket looks like it is earthed to the box so I guess the earth lift wouldn't do anything if the other sockets aren't insulated. Also looking at the manual it seems that 9v is OK but doesn't give the headroom of 12v or 48v, as you would expect. By the way excellent work with this it is just what I was looking for but didn't know existed, at least not with the speaker input option. Dave, I don't believe that the Red Box classic or even the Mk II had a ground lift switch. The manual (see above under the "Original Info" section for a link to it) or either of the schematics I've seen (RB Classic by Bernard d'Ur, link provided above, or RB MkII by Gottfried Divos) show such a switch or discuss it. "The Balanced Out signal hums: .... The amp and the mixer/recorder’s earth circuits have formed a ground loop. Activate your amp‘s or the mixer/recorder’s ground lift switch, or use a transformer to galvanically separate the line circuit." No mention of a ground lift on the Red Box itself. According to the veto layout, sw1 is ground lift? Having just looked online, the red box pro has a ground lift switch but also has a switch to select between Lin or speaker input which this layout doesn't have? But having looked further, the Pro version has a transformer in the output - not knowledgeable to know if that is essential to having ground lift or not? Well spotted! The schematic by Bernard d'Ur has it but I think it shouldn't be there. Just remove the switch, 470R resistor, 100n cap and connect XLR 1 to ground. Ever wished that you had researched a bit more before posting... I have now found a review of the "classic" that states "On the bottom of the unit there is a ground lift switch which is not labeled." it also says it is not mentioned in the manual. I therefore think that the original layout might well be correct - although I'm not sure whether it is really a ground lift or actually a ground filter since the XLR is still connected to ground but through a resistor and cap in parallel. I'm thinking that it may be done this way to allow phantom power to still work? Has anybody built this yet and used it to record into a computer just wondering how it sounds. I am in the process of building this. just to confirm, is the switch in the layout the combo/4x12 voicing switch? hi alex! i have question!! I don`t Spk. simul... Do you konw spk. simul bypass..? How important is it that the Zener diode be 27V? Any hints on where to get one or a suitable replacement? I'm about to try out a 1n5361 diode in this, I got it from RS Components. I see mouser also has them. They're a bit chunky but I got it to fit. I'll post if it explodes. I've built this but am getting very low output. I have traced the signal through using an oscilloscope and it is fine right up to the 6k8 resistor(s) at the output. Having looked at the schematic this doesn't surprise me as the 6k8 and 470r form a voltage divider which drops the signal to about 1/14. Should the 470r not be 470k? Well I replaced the 470r with 470k and works perfectly now, tested it between amp and speaker and captures the amp sound really well, no more microphones needed. The output was a bit low now that I think of it. I'll give this a try. Both 6k8 and 470R combination are voltage dividers, according to the schematic. Did you change both 470R's to 470k resistors? Can someone please confirm which of the two 470r resistors should be replaced with 470k or is everyone replacing both? I tried changing both and didn't get any signal. Only the one most on the righthand of the layout should be 470K. Great layout. I want to build this for rehearsals to get straight into the mixer, since we use headphones, no amps at rehearsals, and my guitar sounds like an electric razor. Only thing I'd like to know is if this layout would work perfectly with phantom power or not? If so, I can only use the line in and the XLR out and skip the other jacks. Yes I can confirm this layout works with phantom power as that is how I powered mine to test it. Anyone who's had the same problem? Have just (finally) gotten around to building this and it works with a few variations, namely a TL074 in place of the TL064, 30v Zener not 27V and 1n4001 in place of 1n4007. If used as a direct line(not between the amp and speaker), the input signal goes in "From Speaker"? No the guitar input would be "line in"
I still didn't build this, but looking at the schematic I believe I can see a huge problem. The 470 ohm resistors and the 6K8 resistors seem to be swapped. On the schematic the phantom power voltage divider is made by the 470 ohm resistors. I believe it should be the 6K8 resistors as with everything else that uses phantom power. The the 470 ohm resistors should connect to the outputs of the opamps. The mistake I am seeing could explain the low audio output some are experiencing, but worse, the 470 ohm resistors collecting the 48V phantom power are putting a quite big load on the phantom supply :( I believe we don't want to damage our mixers, right?? Having just tried my build with phantom power I found that it wouldn't work so did a little research and I agree with the post above that the 6K8 and 470R resistor pairs are swapped on the schematic and therefore layout. Luckily since I had already changed the 470R resistors to 470K I didn't damage my interface due to taking too much current if this would be an issue. I have now wapped the 6K8 and 470R (I reverted back to the original value from the 470K I had used) and all seems perfect, works on phantom power and the output level is slightly higher than before (and much higher than with the values as per the layout). With this change the build is spot on and recommended to anyone who wants to capture the sound of their amp and pedals without miking up or worrying about background noise etc. Thanks guys! I've updated the layouts! Well I came here to ask for some help, because my build has low output to my sound card and when I increase the amplifier’s volume there is some clipping. Then I read your post! I hope this if the fix. I will change the values and let you know if I have good signal on my soundcard/mixer. Supperb DI and cab sim! I posted pics and comments on GFXL Forum (Show your pedal guts! thread). All resistors are less than 1% metalfilm. D1 is 27V/1W 1N4750 (couldn't find BZX85C ones). Tested with 48V phantom only, since I hadn't a 12V adapter on hand.